I like the overall look and feel of the mouse, there are a few things that don’t work perfectly for me, but they may for you. I’ll get into that more in a minute. I like the basic look of the mouse, it’s clean, simple and looks like an “older style” mouse, but with some nice upgrades; what I’m trying to say is that it looks like a mouse, not a spaceship. 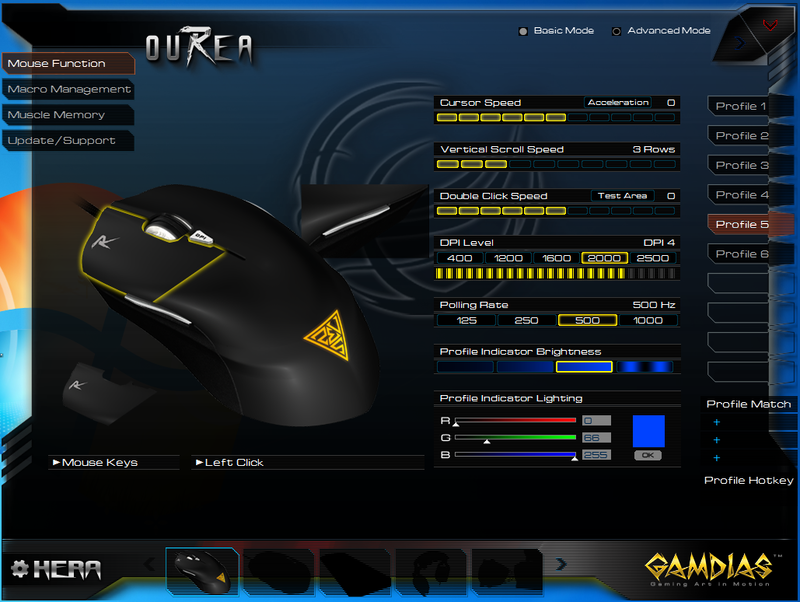 The Ourea offers some basic RGB illumination on the mouse wheel and an orange illuminated GAMDIAS logo on the back. 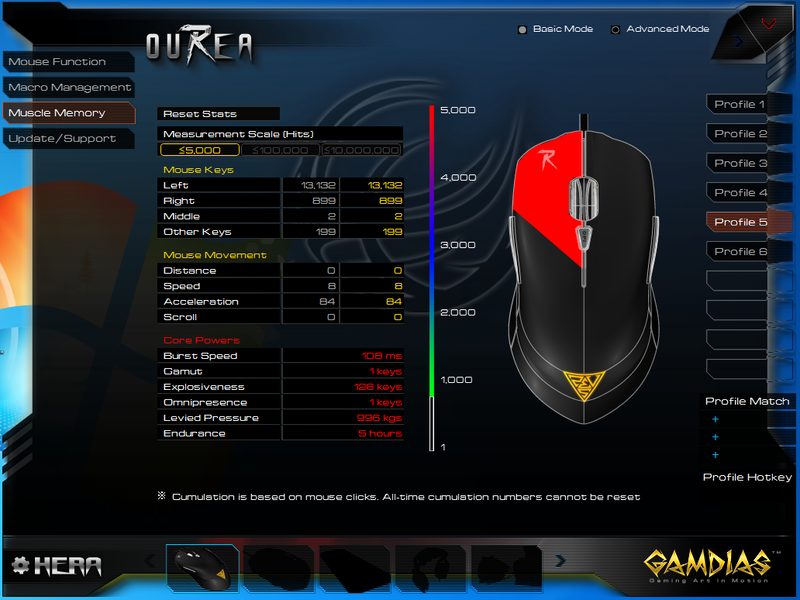 The mouse wheel is the only area where the lighting can be adjusted via the management software, but it does support the full RGB spectrum. It would have been nice for the lighting control to also adjust the logo color, but, It’s covered by your hand while in use anyways. The mouse is also designed to be ambidextrous, this puts some of the buttons in a bit of an odd place. 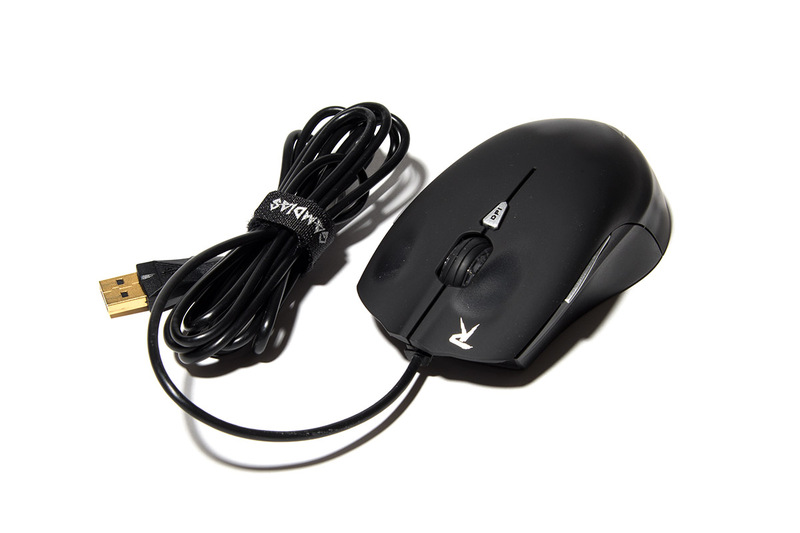 The mouse is pretty much a mirror image left and right, so if you are left handed, this might be a good mouse to check out as it will be the same, left or right. The buttons on the Ourea are a little stiff for my liking, the main left click button requires a hefty 5.8 oz (average) of force to click. In comparison my Logitech G502 only requires 2.7 oz (average) of force. These mice are definitely quite different, but that’s not necessarily bad, it will all depend on what you like and are going for. The button placement for the “forward” button, located on the right side of the mouse, is in a place where I often accidentally click it with my ring finger. I think the placement is due to the ambidextrous design of the mouse. It pushes the button into a location where it will work left handed, but is always in the way for the ring finger. I guess it’s a plus that it requires a lot of force to click. I think this will depend on how you hold your mouse, but for my hand size/position, the button is placed in a location that if I squeeze the mouse, I end up clicking it. Other than those items, the buttons work, and the functions are customizable via the management software. It all really depends on your hand size and how you use your mouse… For me, the mouse works very well as a general use mouse, or for basic gaming, the force required to click is just a little much for me for any real high-speed applications. 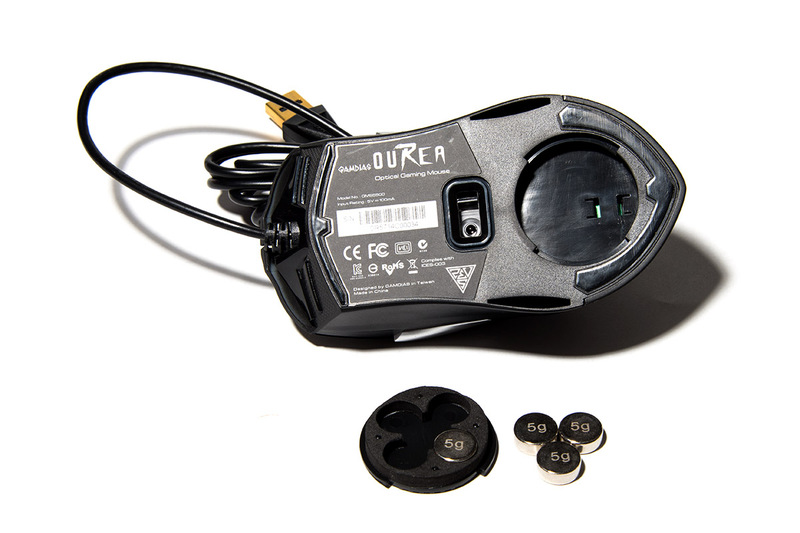 The Ourea has 4 – 5g weights tucked away in the bottom of the mouse. This gives you some basic options for adjusting the weight and “feel” of the mouse. I found that I needed to remove most of the weight, to “lighten up” the mouse. I like my mouse to feel relatively quick, with all of the weights in the mouse it felt a little sluggish to me. 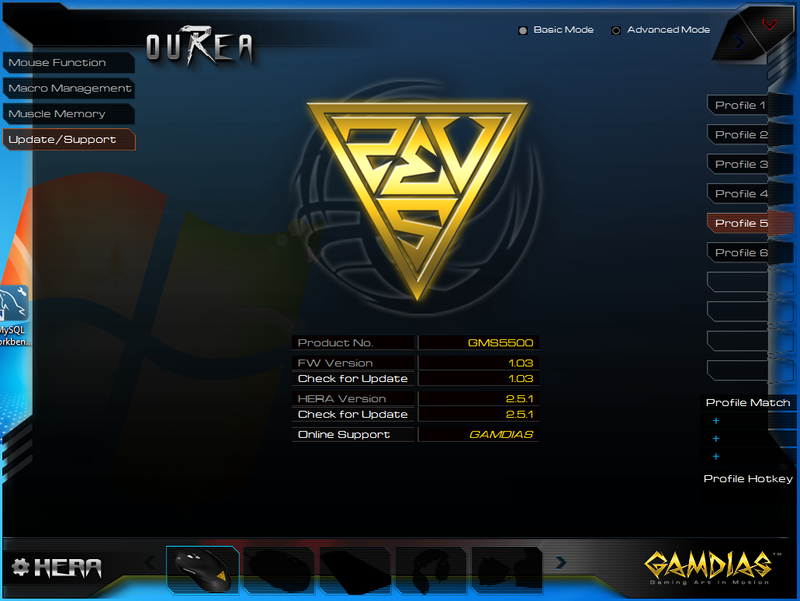 The mouse firmware and configuration is manageable by the Hera management software provided by GAMDIAS. This software is pretty portable, and doesn’t kill your system with a nasty installer and heavy requirements. But it is a very “stylish” application, a little too much in my opinion. For 3rd party applications, I prefer small footprint, easy interface, and limited to no bells or whistles. That being said, the Hera software is probably one of the least intrusive management applications that I’ve run into in quite a while (at least as far as this mouse is concerned). There are two modes in the software, Basic and Advanced. Basic is probably all that you will need unless you are doing something really custom. I found the color controls and profile management to be quite easy to use. The Macro setup and button function assignments took a couple seconds of playing around with to get to work, but if you have ever used any hardware management software before, it should be pretty easy to pick up. 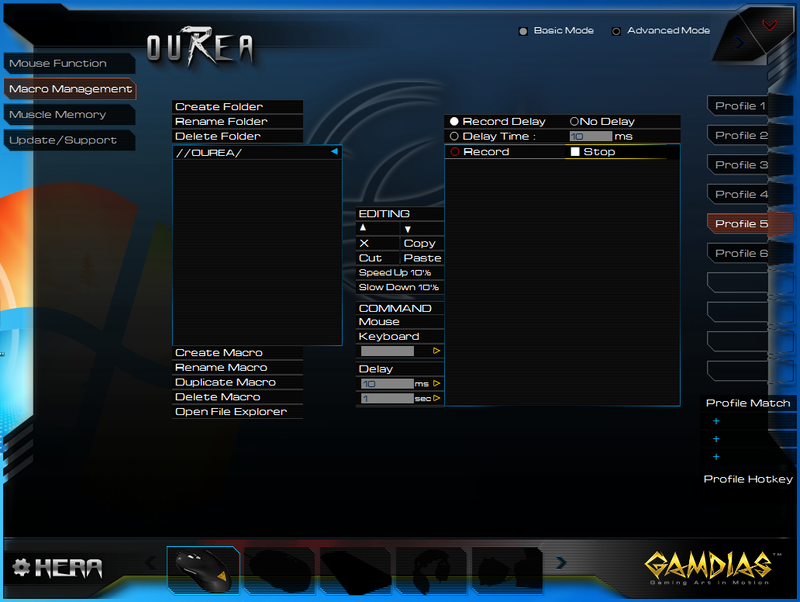 Also, the Hera software seems to be a one stop shop for management of all of the GAMDIAS products. If you see on the bottom, there are grayed out areas where if you had other things like a GAMDIAS keyboard or headset installed, they would be selectable. Definitely nice to have one application to manage everything, instead of one application for a mouse, one for a keyboard, etc. Another cool feature of the management software is the “Muscle Memory” tab, this shows a history of the clicks of each button as well as some other general statistics. It really serves no purpose, but cool numbers to be able to see. Firmware updates were something that I was a little shaky with. When I first connected the mouse, the firmware was a few versions behind so I decided to update. I ended up having to unplug and re-plug in the mouse a few times, and finally the firmware updated successfully. But it took some messing around, something that is not ideal. It was probably just some “issue” with my system, or something along those lines. But it all came out OK in the end. 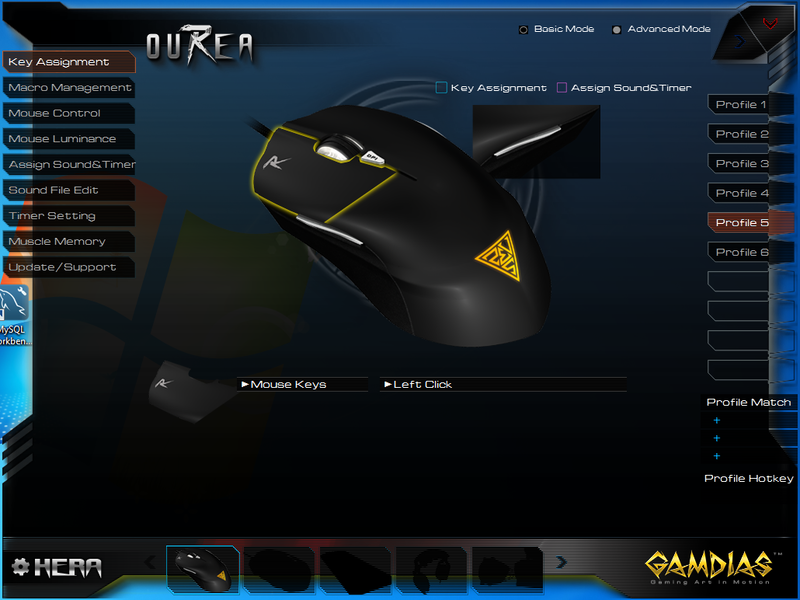 Overall, I like the Ourea mouse. 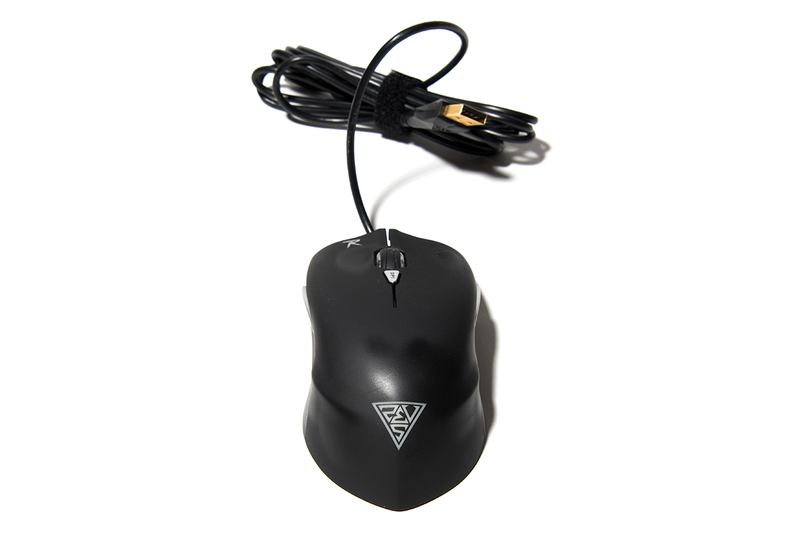 It’s a basic “upgrade” mouse from some of the other more generic plain options out there. It looks like more of a “gaming” mouse, and has a decent set of features for the price tag. Don’t expect this mouse to replace your $100 gaming mouse with 12 buttons, Teflon slider pads, and 2 oz buttons. But, it’s a nice entry level mouse for someone that maybe doesn’t have the budget, or is looking for something more basic, will work left or right handed, and wont break the bank. In the end, the GAMDIAS products, thus far, have been quite nice; especially for the more budget conscious people out there. They are definitely worth a look.